Welcome to 2913 Valle Vista. If you’re looking for charm, character and easy living, you’ve found it in this captivating town-home. Valle Vista is a quiet cul-de-sac with community tennis courts & swimming pool located close to hospitals, dinning & shopping. You enter the home through a lovely courtyard and into a large living room with kiva fireplace. 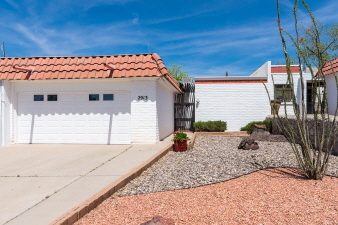 The 1570 square foot home offers three generous bedrooms and two full baths. The well appointed kitchen offers a built in breakfast bar with extra storage, tile countertops, large pantry, new dishwasher and ample cabinets. Other features include a dinning area, sun room, two car garage and the best of all a quaint back yard full of lush green trees and patio areas for outdoor living. You will enjoy the views of the outdoor space and lots of natural light through eight sliding glass doors and two different patio areas. The home offers other amenities such as refrigerated air, brick accent walls, skylights, and new laminate flooring in the living area.